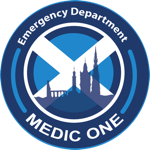 The Emergency Department at the Royal Infirmary of Edinburgh already has an established track record of cardiac arrest expertise co-ordinated by the Emergency Medicine Research Group Edinburgh and the Resuscitation Research Group, and the ED now treats over 200 patients with cardiac arrest a year. Unfortunately, despite a huge rise in Lothian of patients surviving to leave hospital after suffering cardiac arrest, this still means that many patients do not survive. It is on this background of cardiac arrest expertise and a continued unmet need for transplantation within the UK that it was decided to commence a programme of uncontrolled organ donation after circulatory death within the Emergency Department in January 2013. The programme includes those patients who arrive in the ED in non-traumatic cardiac arrest, whose resuscitation is unsuccessful, who are not candidates for aggressive interventions such as intra-arrest percutaneous coronary intervention and cardiopulmonary bypass, and who prior to becoming unwell, have expressed a wish to donate their organs. This staff training video summarises the processes involved in our programme.